The wind whistles through the crevices of the buildings, creating an eerie feel as I huddle in a dimly lit room next to a radiator heater. Visibility has been reduced to almost nothing. When I look out the window over my mother’s balcony, I can only see a few of the buildings in front of me, while the rest are cloaked in what appears to be a thick, impenetrable fog. What appears to be fog is really a thick, suffocating mass of pollutants and poisonous particulate matter. That fog is made up of larger particulate matter which can be blocked using a modest dust mask, and invisible particulate matter (PM 2.5s) – a poisonous particle so small (2.5 microns) it can pass through a heavy duty gas mask. PM 2.5 levels today are at 365 microns, a level 15 times higher than the maximum recommended exposure (25 microns) over a period of 24 hours by the World Health Organization. My throat is raw and choked, and my lungs hurt as I dejectedly breathe the poisonous air from inside my mother’s apartment. Small, shallow breaths are all I can bear to take, and each breath I take makes me dizzier than the last. Both of my parents developed a high fever overnight, with body aches and chills that did not let up through the night. Today, we went to the hospital to get medication for my mom, whose lungs were burning. Every breath she took caused her to react with a wheezing cough that sounded so painful it made me feel sad. I have ever seen. Dozens of elderly people were on respirators, strapped to gurneys and lined up in the hallways. The hospital had chosen to perform heavy construction and to remodel the place on one of the days with the worst air quality since the infamous December 6th, where flights were canceled and children and the elderly were ordered to stay inside. The construction was sending more pollutants into the air, but no one seemed to care. This was a country that valued industry and productivity above all else – even at the cost of the well-being of its citizens and of the world. The sight of this infuriated me. Affected elderly were lined up on gurneys, choking in the hallway on cigarette smoke that was aggravating the already dire situation. I glared at the people smoking in the hallway. They casually brought cigarettes to their lips, flicking the embers onto the ground. Lung cancer was not a concern, it seemed. To my left, a distraught middle aged woman repeatedly wailed and sobbed “mother” as she threw herself on the ground in agony. Her mother had just died. For those of you who don’t already know, breathing in air pollution and the intake of PM 2.5 particles is directly linked to lung cancer. Don’t believe me? Click here to see the World Health Organization’s article on Cancer.org. Click here to read a recent LA Times article titled “Lung Cancer: A Cloud on China’s Horizon.” The extremely disturbing LA Times article contains unnerving statistics about children from non-smoking families as young as 8 and 16 being diagnosed with lung cancer in Shanghai and Beijing. The Chinese government has done everything to try to hide this from its citizens, blocking news and opinion websites with accurate information about related health risks and writing articles minimizing and downplaying the danger. “If your child isn’t coughing, then he or she is not affected by the smog,” one Chinese article read. “You only need to start worrying if your child actually starts coughing.” I CAN’T TELL YOU HOW ANGRY I FELT WHEN I READ THAT. When breathing (something you do every day, and every second) becomes something this problematic, it becomes an issue that is top of mind. The average human breathes in 7-8 liters of air per minute, totaling about 11,000 liters a day. When the air you’re breathing is actually POISON, this becomes a major issue. (Duh!) 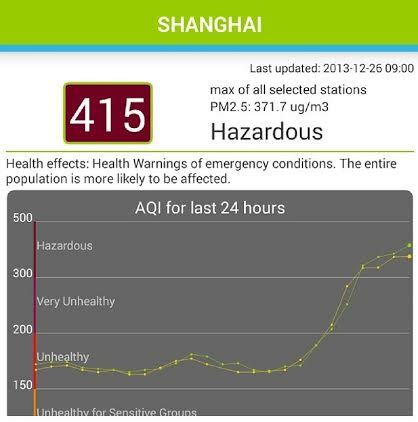 This problem doesn’t just affect Shanghai. Particulate matter originating in China has been found in the United States already, and it doesn’t just go away. If choking on poisonous air particles and smog isn’t your idea of a nice way to live, please take the following steps to help reduce pollution in your area. Let’s keep San Francisco air clean and do our part to make sure this never happens to us. You will feel better about yourself and be confident that you’re part of the solution and not the problem. We all need more of these people in the world. Lower your thermostat and run the heater sparingly. BIKE! Whenever you can. It’s fun, healthy & emission free. Buy ENERGY STAR products, including energy efficient lighting and appliances. Choose gas efficient, low-polluting cars. Drive a hybrid if you can. Get regular engine tune ups and car maintenance checks, smog checks.